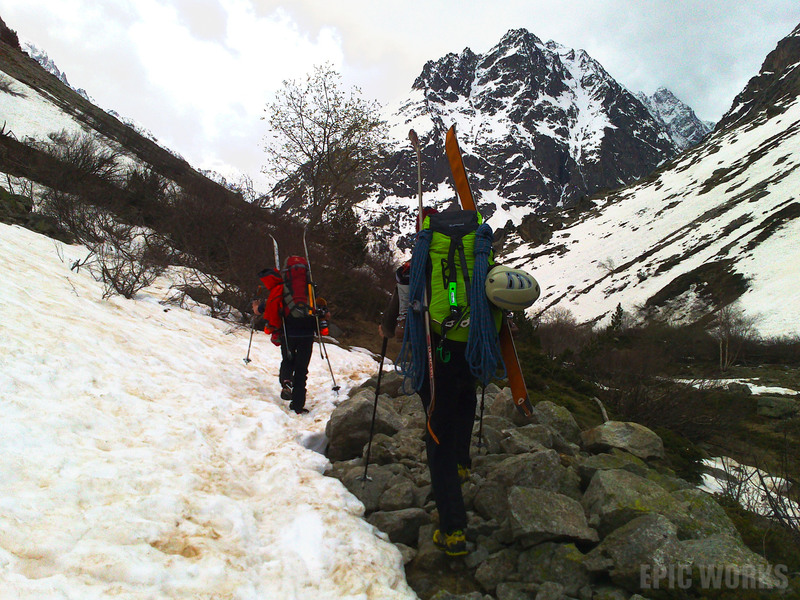 After a failed attempt a fortnight ago, I convinced T. and J. to go back to the Ecrins to climb and ski the Rouies. 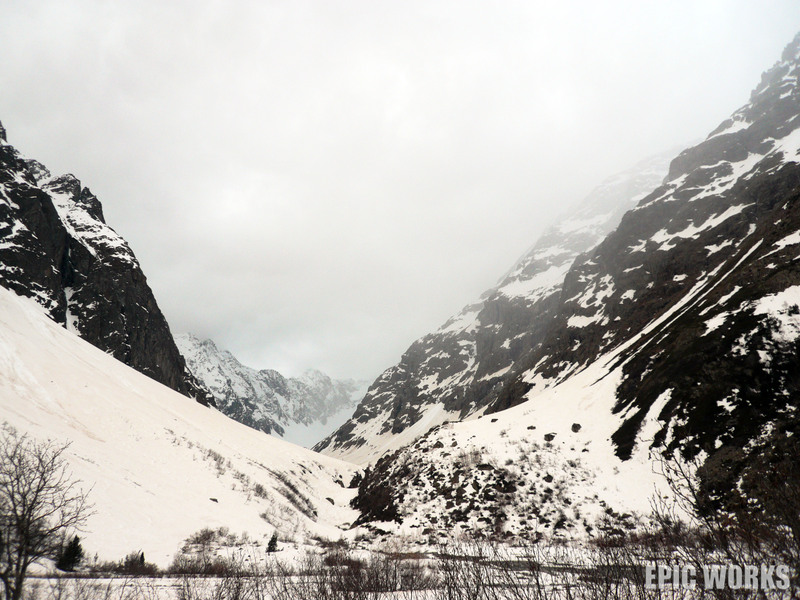 It’s a 3500-something on the southern side of the massif, accessible by the Glacier du Chardon. After the last experience, I knew it was a long if albeit easy ski up. At around +2000 vertical and several kilometres we decided to leave on the Saturday afternoon, hike up to the Refuge du Carrelet and attack the ascent early Sunday morning. With dire weather reports, we cheerfully finished packing and set off. Halfway through Bourg-d’Oisans it started to rain very hard followed by a steep drop in temperature. I was very glad when we finally drove out and found dry roads all the way to La Berarde, were we started hiking. 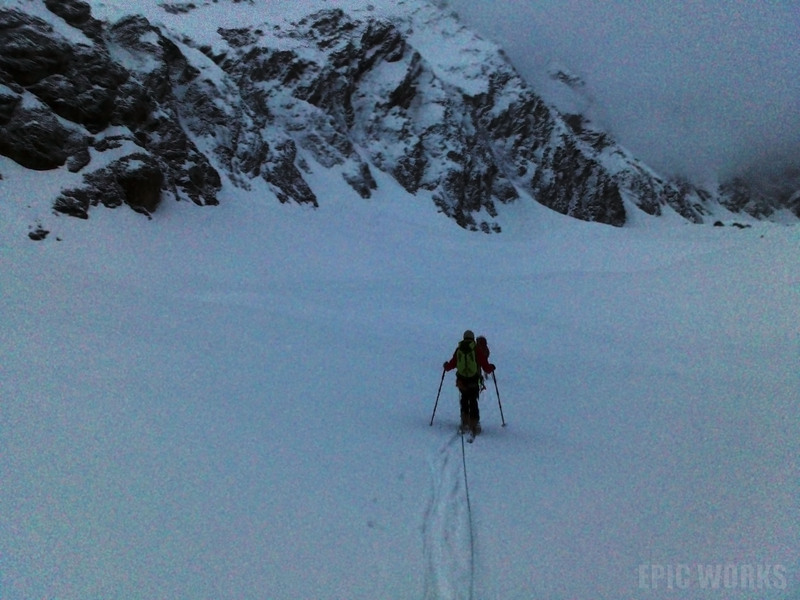 The snow line had receded since my last visit, so we carried out skis all the way to the refuge. We could see the weather worsening in the east, so after scouting the river crossing we would need in the morning, supper was prepared. Halfway through our meal we were joined by three polish skiers coming over from La Grave. Reveil at 4.15, a quick look outside revealed a few centimetres of the white stuff covering the ground. Coffee, porridge and honey went down quick and soon we were heading into the dark. As all the snow bridges has gone, we needed to jump/fall-into the little rivers cutting across our path. Luckily we had checked it out in the evening. A first steep climb and we entered the long valley of the glacier. 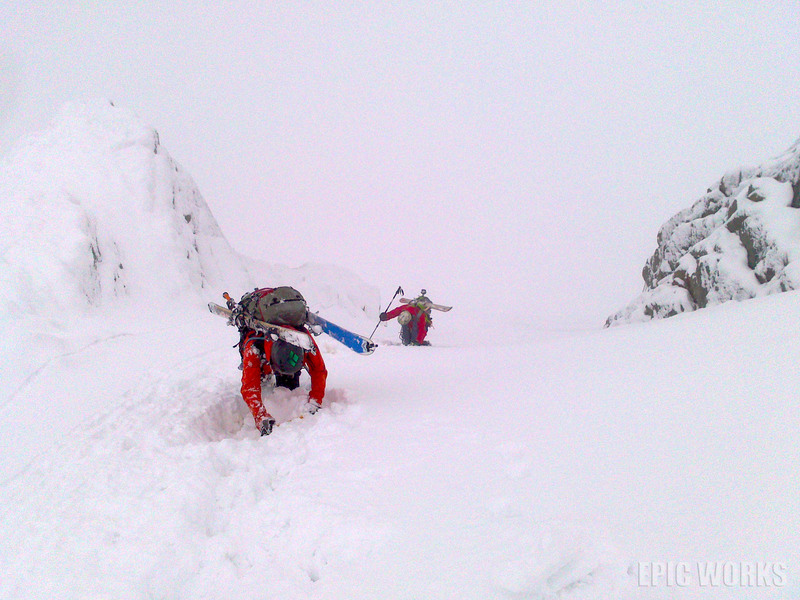 A nice covering of fresh powder was on a slightly harder sludge base which had frozen in the night, giving good purchase along the traverse. Slowly day broke, and we could look up the valley. The sight didn’t last long, as clouds soon rolled down and in a few minutes visibility had dropped to a few metres. 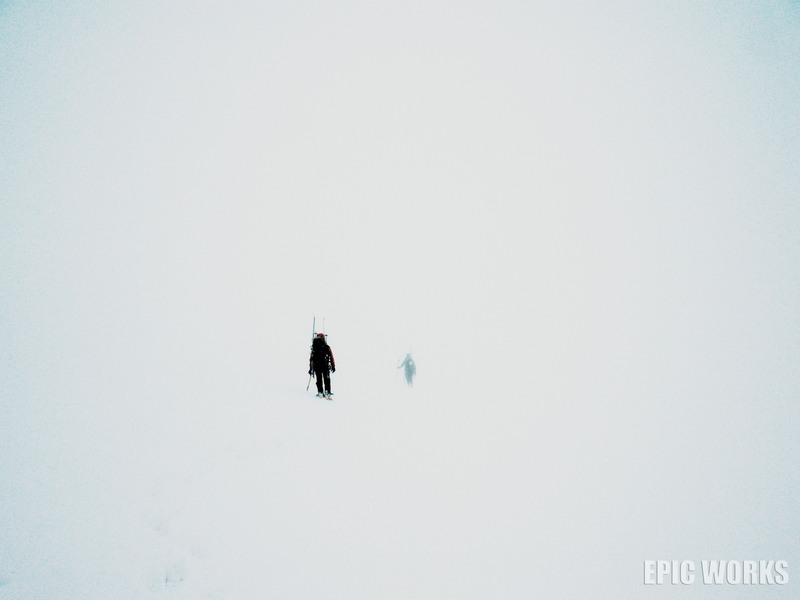 Snow-plastered walls soon disappeared as the clouds rolled down. We continued on during a couple of hours, searching for the break on the right hand side that takes you up the the superior glaciers. 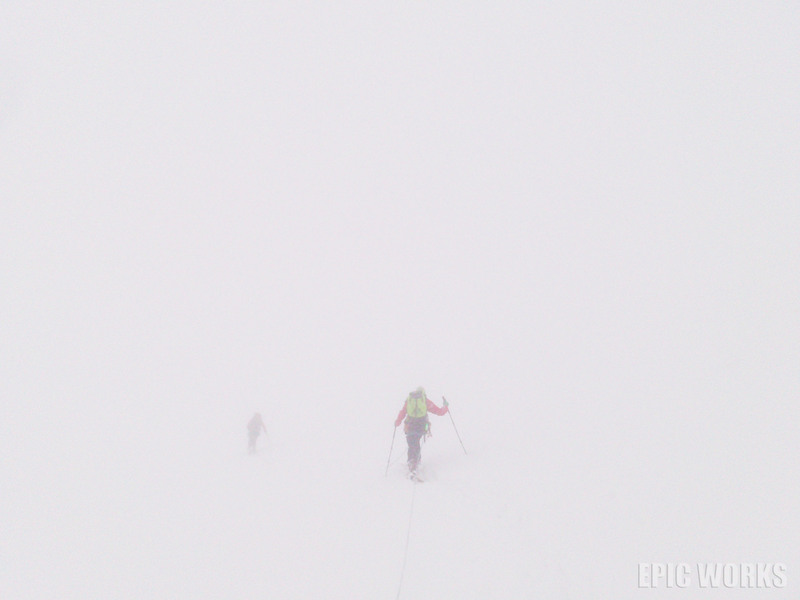 Due to the lack of visibility and softness of the snow we roped upon the glacier. By this point navigation was completely based on compass and altimeter, slowing things down considerably. 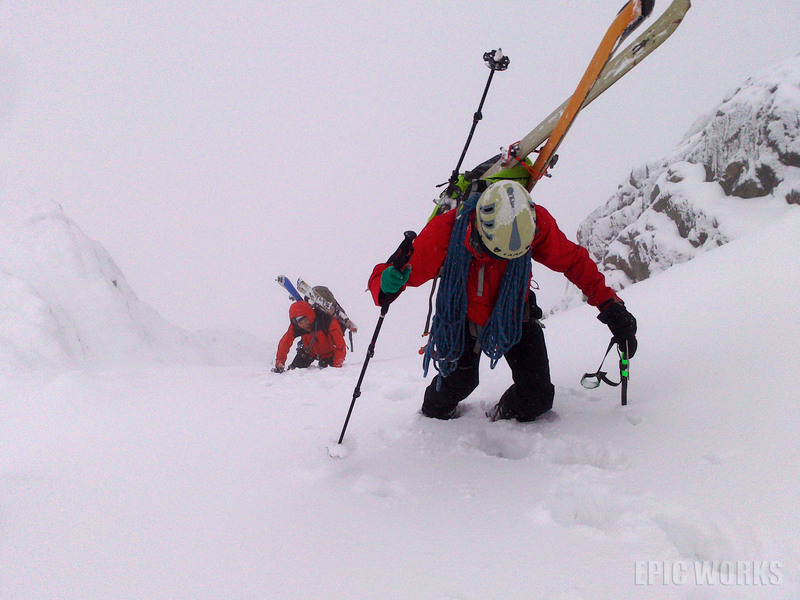 Trying to remember which slope I had taken last time, and getting to the end of the valley, we finally took the decision to climb a promising couloir. Visibility drops. Orientation difficulty increases. 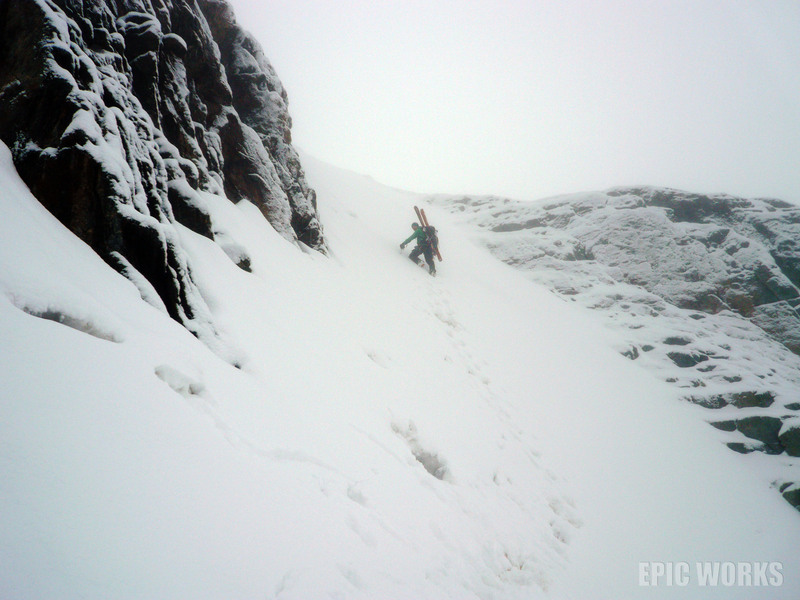 With the soft snow it was relatively easy to kick footholds into the 45-50 angle slope before it flattened out. By this point I was sure this was not the route we had taken, but we continued up in the general direction of the second glacier. I start to climb up! Decisions, decisions! By this point any possibility of hitting the peak was gone, and our progress slowing all the time. Taking into account the expanse of the glaciers and the expected weather reports, retreat was called. Normally a firm opposer of GPS’s, we accepted it’s uses in certain situations. Such as this one. It seems to be the only way to keep a good speed up in such weather. So we added it to our shopping list and turned around. 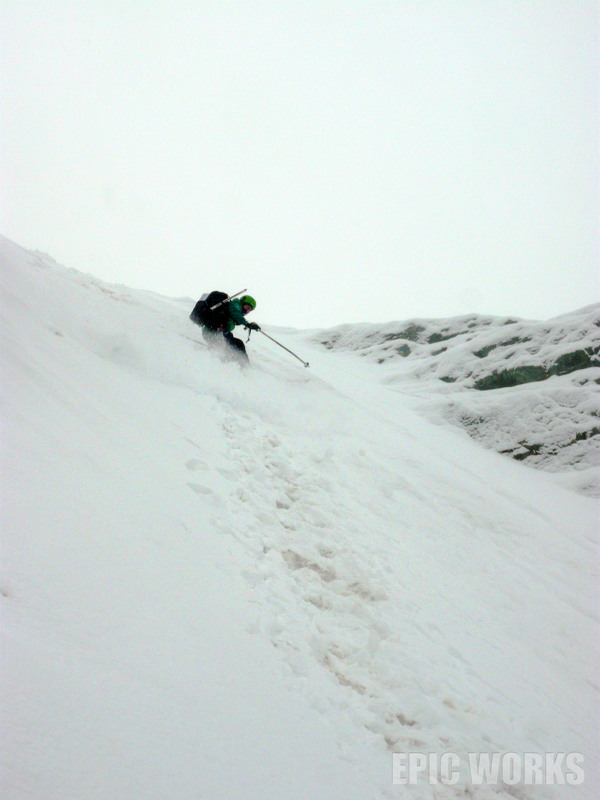 Having climbed up the couloir, all I wanted to do was ski down it. Once T. & J. were out, and clear of my impending fall, I took a first run. The soft snow on the hard base gave a decent if irregular purchase, and I managed a first decent. Enjoying the sensation, I re-climbed the slope for a second run. Alas, as soon as I started I realized that having my ice axe passed through one of my harness hoops was not a good idea (I was too lazy to carry my backpack up the second time). 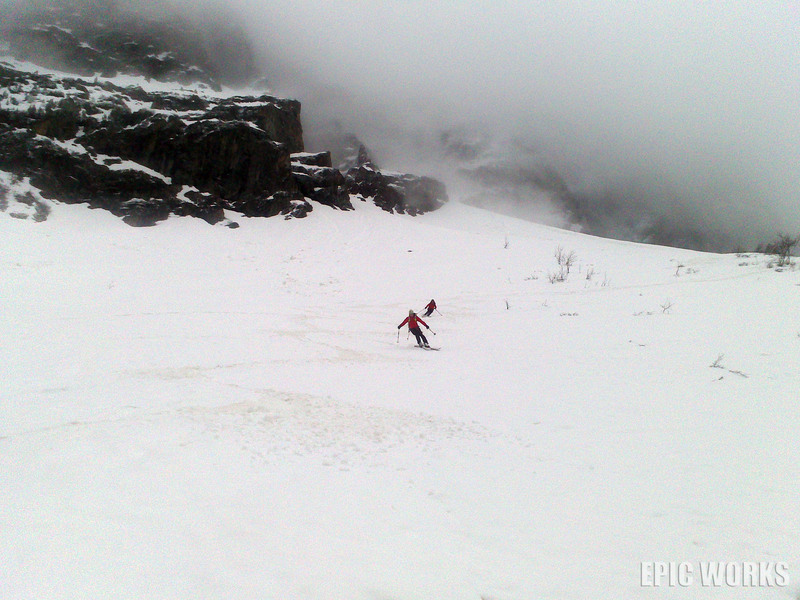 On the second turn the tip pushed into the snow and pitched me off my skis. Several spins and bumps and I had slid all the way down. Covered in snow but unhurt I had to climb up again to get my pole. Once there, why not go for a third! More prudently, and with less snow I made my way down. What followed next was pure ecstasy. Slowly picking up speed, we flew down the valley, using each other and what was left of our tracks as reference points. I could feel my face freezing and had to keep blinking out the snow, both falling out of the sky and sprayed up by my companions. I could see figures cutting graceful curves through the powder. Like a firework display, you know it can’t last, so just try to take in as much of those seconds of intense joy. And of course, like the best displays, the powder eventually ran out and we slowly came back to earth. T. & J. sign their tracks onto the mountain. 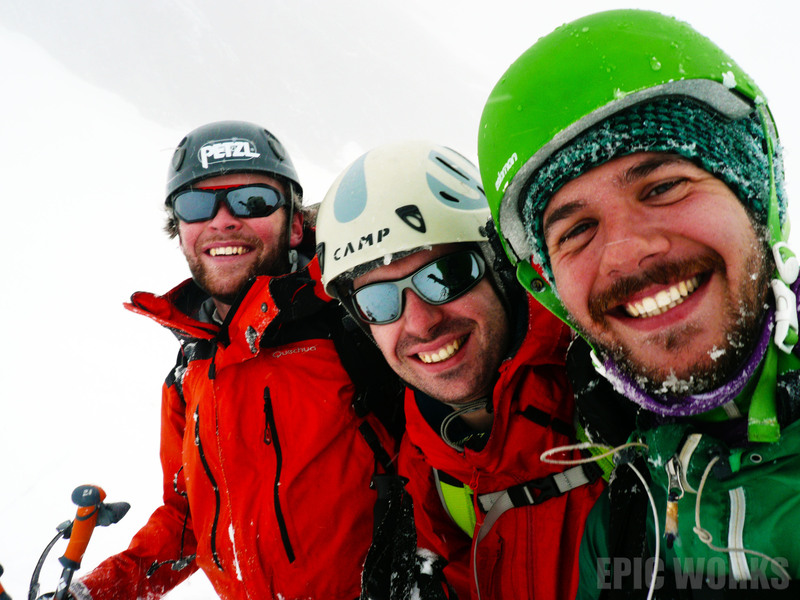 Coming out of the clouds, our smiles were as white as the snow. Happiness is the colour of snow. All that needs to be done now is climb that dammed peak!